It’s been six months since our last look at a NAS and that one was the excellent budget offering from Synology, the DS416j. While that review covered a NAS on the lower end of the price spectrum, what we have today finds itself well at the other end, and is not only the most expensive NAS we’ve looked at to date, but also the largest in size, capability and overall capacity. Today also returns our focus to another excellent NAS company, and still somewhat new to the market, ASUSTOR. It’s been eight months since we last worked with an ASUSTOR NAS and we’re excited to return with the eight-bay AS6208T. 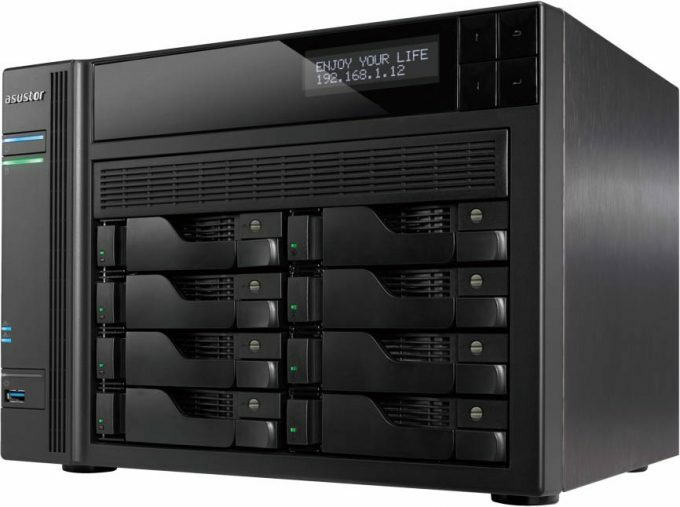 Supporting up to 10TB drives, the AS6208T offers up just under 80TB of usable space when configured in RAID0. Think about that. 80TB of available space to be used for backups, file sharing, SMB workload, or even high-definition media playback. That’s really and truly impressive. All that being said, let’s step back from the thoughts of that much space and fall back to reality. The AS6208T shipped to us without drives so we installed our own 4TB Western Digital Red NAS drives for testing. Somehow just under 32TB of usable disk space lacks the impressive punch of 80TB, but such is life. Boo hoo. For anyone familiar with ASUSTOR NAS devices, the overall look of most of its models remain common. Take the AS6104T we looked at last summer, flip the drive orientation 90 degrees and enlarge it enough to fit four more drives and you have the AS6208T. Powered by a 64-bit Intel Braswell Celeron quad-core processor (then same family of CPUs in the AS6104T) that’s clocked at 1.6GHz and burstable up to 2.24GHz, the AS6208T is more than capable of providing quick file services while running the multitude of third-party apps that fill the ASUSTOR app market. The AS6208T shipped with a pair of 2GB DDR3L DIMMs and is expandable up to 8GB (2x4GB). Another great feature of the AS6208T is the inclusion of hardware encryption, which means should your NAS ever end up missing, your data will be safely encrypted and unrecoverable. I should note that enabling encryption can reduce the speed of data transfers, but for some use cases, that’s a small price to pay. On the outside of the AS6208T, we have the standard NAS IO fare and then some. On the front we find a pair of buttons, power and USB copy, and a single USB 3.0 port. The back of the NAS is quite a bit busier, with a pair of eSATA ports, two USB 2.0 ports, two USB 3.0 ports, four Gigabit Ethernet NICs, a small form factor internal power supply and my favorites, an optical audio out and an HDMI port. As exciting as it is to see four Gigabit Ethernet NICs on the back of the AS6208T, I am still impressed that ASUSTOR continues to include HDMI on almost all of its products. Not only is the NAS capable of 4K playback, but with the inclusion of HDMI and audio ports on its products, ASUSTOR is continuing to make the argument that the NAS has a place in the living room alongside all the other consumer electronics we’ve become accustomed to having connected to our televisions. Helping further to make its case is the inclusion of an IR receiver on the front. With the Intel CPU and eight spinning disks installed, there is going to be a decent amount of heat to be displaced. 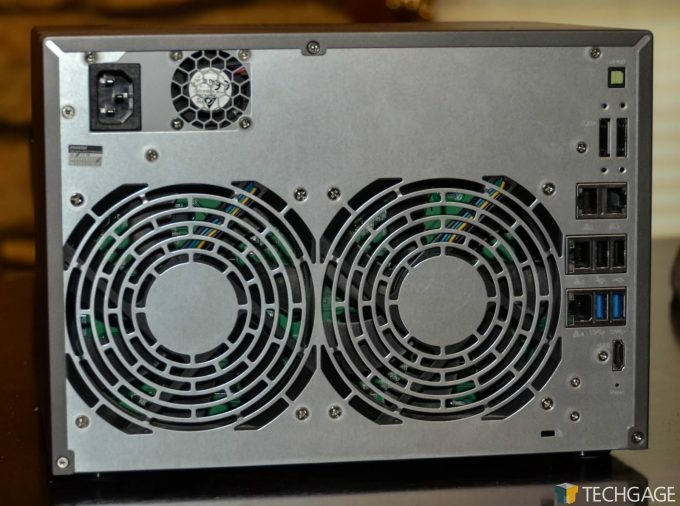 To do this, ASUSTOR engineered the AS6208T with a pair of large fans at the rear of the chassis to pull cool air across the perforations at the front and along the left side of the NAS. 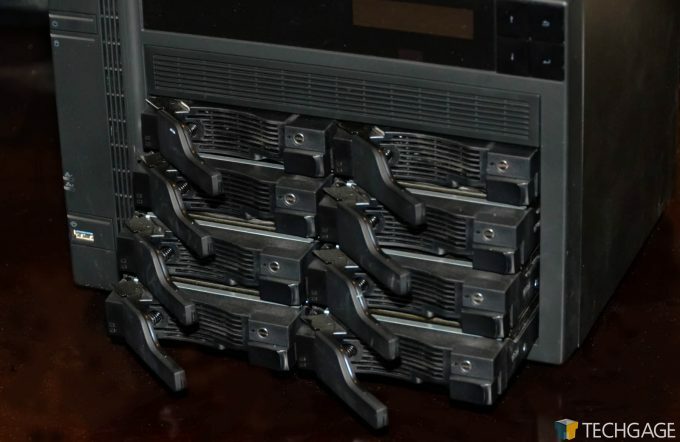 If you choose to install SSDs in your AS6208T instead of traditional hard drives, you can easily do this as the drive trays have mounting holes at the bottom of each tray. We’ve spent a lot of time speaking about the user experience found on Synology’s products. DSM is still the gold standard for NAS user interfaces and while it might seem odd to bring up a competitor’s product in this review, I do it only to state that ASUSTOR is quickly catching up. In our AS6104T review, we took a short look at the ASUSTOR operating system, ADM, and not wanting to repeat ourselves, please check out our thoughts on ADM in that review. The version of ADM in that review was 2.6 and the latest version available today is 2.7. Aesthetically, they both look identical, but there are some differences introduced in 2.7 that should be mentioned. 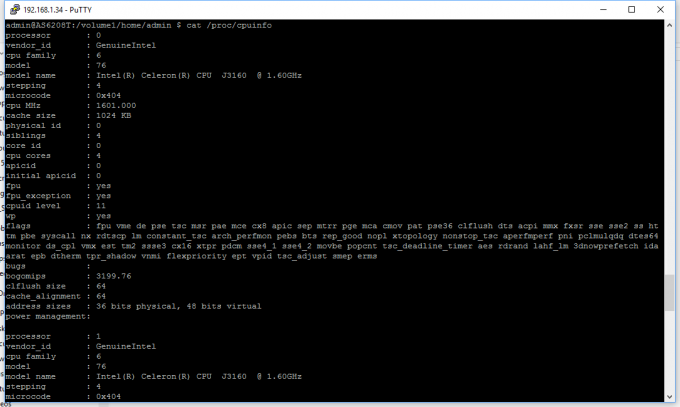 Linux kernel upgraded to 4.4.24 for upgraded security, stability and multimedia enhancements. EZ Connect allows users to connect to their ASUSTOR NAS remotely without the hassle of router configurations. This feature will also do the router work for apps that are installed. Scheduled and autonomous firmware and app updates. Heterogeneous data sharing via CIFS shared folders (mounting files and directories within ADM file exporter). ADM 3.0 should enter beta testing in the coming weeks and when it becomes available, we will take a deep dive into what’s new and exciting, but for now, anyone wanting to experience the ASUSTOR ADM operating system for themselves, you can do so at ASUSTOR’s live demo page. Using ‘demo | asustor’ as the login credentials, you can experience all that ADM has to offer without the initial investment of buying your own box.